Ever since the beginning of the economic collapse, Greece has seen unprecedented levels of unemployment, inequality, racism, and political instability. Politicians are treated as felons, exposing their gross acts of corruption that have been hiding under their public image for decades. These conditions have forced people to abandon their homes, starve, protest, even commit suicide in public. The Athens 2004 summer Olympics have recently become a prime example of how large sports events can drive a weak country into monumental debt. The poor management, corruption, and abundance of enthusiasm drove the organising committee to spend ridiculously over the initial budget, borrowing to cover the costs through public lending. 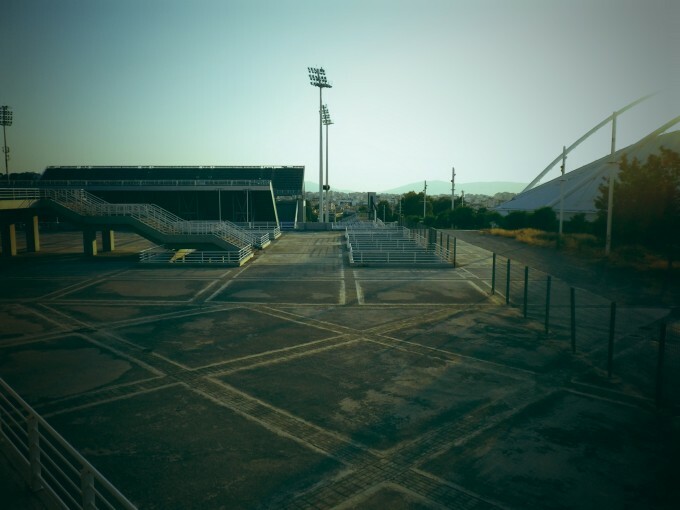 By building permanent venues for sports that are alien to Greeks, the legacy plan became impossible to manage. Today, the cost of operating these stadiums is so high that the facilities have been left to their own demise. The 2004 Olympics facilities scattered around Athens stand still, reminding Greeks of another era; an era of optimism, patriotism and grandeur. Juxtaposed with the pain of austerity and strife, these monuments of frantic overspending have little use other than reminding us of an illusionary time. “The Olympians” is a proposal to stimulate social change by opening up the derelict Olympic venues and allowing citizens to create self-organised communities in them. At first glance, this might come across as a dangerous proposition, but if examined more closely, it is the only alternative that can have a large-scale impact.